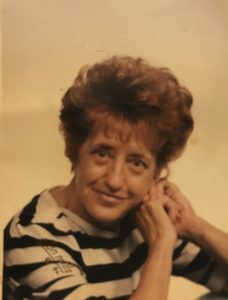 Josephine Jean Sloan, 82, passed away with her family by her side. She was born Dec. 30, 1935 in Chapel, WVa to Cora Dean and Frank Lewis. Her mother was a homemaker and her father was a veteran. She graduated from Kenmore High School in 1955. Jo retired from Carolina Mills in 1998 after 25 years. After retiring, she enjoyed spending time with her family & friends,traveling, gardening,word searches and loved FOX news. She attended Friendship United Methodist Church. In addition to her parents she is also preceded in death by her daughter Sharlet Richard and son Bruce Lawson Jr. Survivors include her husband Charles Sloan, Daughters Tamra Beck (Rocky) and Renee Keller: 11 grandchildren and 8 great-grandchildren along with many other loving family members. The family will gather Wed, November 21, from 5 until 6 at The Good Samaritan Funeral Home.